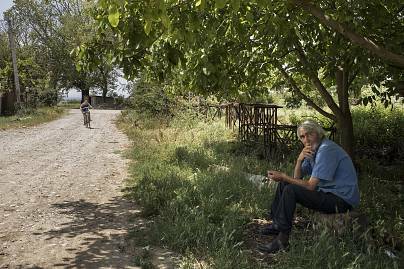 The craggy-faced cattle farmer finds himself on the front line of a geopolitical struggle between Russia and the West.Ignoring Washington's warnings, Moscow-backed troops have been moving a disputed border deeper into Georgia, a former Soviet republic that is now a staunch U.S. ally. Many consider it nothing short of a silent, creeping occupation on the fringes of Europe supported by Russian President Vladimir Putin. "What should I do? If the Russians come closer I will not be able to do anything," Vasya, 51, said with a shrug and a waft of a freshly lit cigarette. 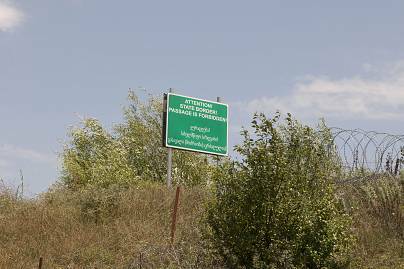 He wants only his first name used for fear of reprisals by nearby border guards.Next week is the 10th anniversary of the start of the brief but pivotal Russo-Georgian War. This six-day conflict saw 850 people killed and 192,000 displaced from their homes. Human rights groups have accused both sides of war crimes. By the time the firing stopped, Russia had driven Georgian troops out of two breakaway provinces, South Ossetia and Abkhazia. 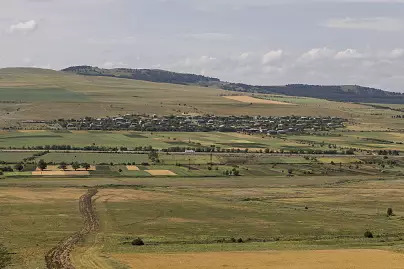 In all, Moscow has built 19 military bases in South Ossetia alone.Russia agreed to withdraw its soldiers as part of a cease-fire deal, but they have not. Instead, troops or their local allies have bolstered the separatists' boundaries or moved them deeper into Georgia. The boundary "has been hardening" and becoming "more impenetrable," E.U. mission chief Erik Høeg said while overlooking a wide valley bisected by the meandering line. "It's been much more difficult since 2009, and we see less flexibility compared to three or four years ago." And yet most experts and locals concede there's little anyone can do about it. 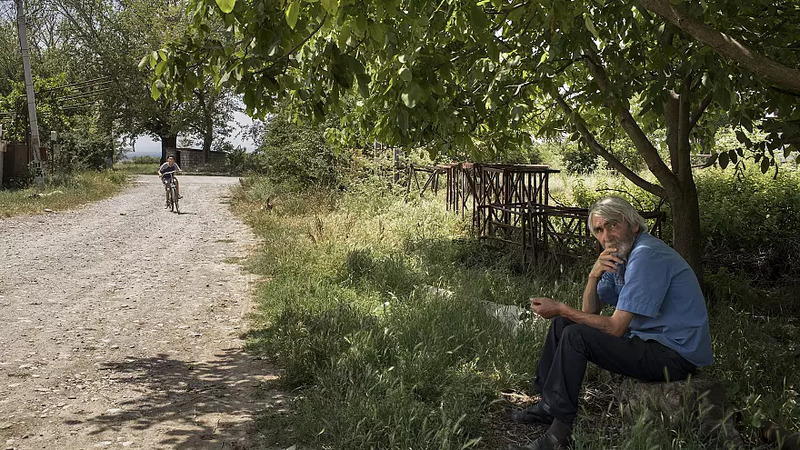 "We can do nothing to protect ourselves … we cannot start war on them," said Temuri Khuroshvili, 59, a retired police officer whose cinder-block house is in one of the 52 villages on the boundary. His home is surrounded by annexed territory on three sides. "What can you do against Russia? They do whatever they can," he said as he sat in the roadside shade while rusty tractors groaning under bales of hay rattled through the dusty lane. "The Russians don't care at all." Georgia is wedged between the Middle East, Russia, Iran, and Turkey, and has become an important corridor for oil pumped from the Caspian Sea. Its geopolitical significance is evidenced by the $100 million the U.S. gives Georgia in annual assistance intended to boost American business, foster democracy and help edge the country's military toward NATO membership. "The United States support for Georgia's sovereignty and territorial integrity is unwavering," said Elizabeth Rood, chargé d'affaires at the U.S. Embassy in the Georgian capital of Tbilisi. "We strongly support Georgia in calling out Russia and the de facto separatist regimes on human rights abuses in the occupied territories," she added, "and on the continued violation of Georgia's sovereignty and territorial integrity." While it's unclear whether borderization is specifically directed by Moscow or Tskhinvali, the de facto South Ossetian capital, it's certain it would not be allowed without Putin's tacit approval. "The Kremlin had many, many chances over all these years to stop borderization," said Olesya Vartanyan, an analyst at the International Crisis Group, a nonprofit research organization. "At the very least the Kremlin is not interfering and not telling them to stop." Tens of thousands of refugees fled during and after the war. An estimated fifth of its remaining population of 30,000 are security personnel.Last year, South Ossetian President Anatoly Bibilov said he wanted to hold a referendum on joining Russia, but that hasn't happened yet. 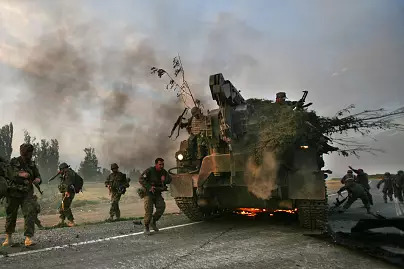 Russia and Georgia still blame each other for firing first in 2008, but at some point Russia dispatched tanks and troops, ejected Georgian forces and embarked on what the West saw as two illegitimate occupations.The roots of the crisis go back to the early 1990s when the Soviet Union fractured and Georgia declared independence. Ethnic Georgians and Ossetians had lived together peacefully throughout the 20th century, according to Vartanyan at the International Crisis Group. "People were very integrated, the links were very close and there were many families with marriages from both sides," she explained in a Tbilisi cafe. "It was a normal thing to marry a Georgian or a Abkhaz or a South Ossetian." The breakdown of the state led people to focus on ethnic divisions that simply weren't apparent before, she said: "When the state system starts collapsing, it's just very easy to start looking for the reasons why it's not working anymore. "The impact of borderization on the region has been devastating. "This illegal process has inflicted immediate and direct damage on every citizen of Georgia residing adjacent to the occupied territories," said Nino Giorgobiani, a spokeswoman at Georgia's State Security Service. The disputed border is just 25 miles from Georgia's capital, Tbilisi, a vibrant, cosmopolitan city where historic architecture and traditional culture complement hipster hotels and a burgeoning nightclub and LGBT scene. A 45-minute drive along the country's main highway quickly disintegrates into steep gravel tracks and unmarked terrain that's barely accessible even to a convoy of four-wheel-drive vehicles. Georgian border police armed with assault rifles stand on the side of the dirt road. Even where there is no barbed wire, residents can be detained for wandering into a field that has been annexed.Entire communities along the boundary have been cleaved in two, and everyone here seems to have a story about friends or family they have not seen in years. NATO promised Georgia membership months before the war started in 2008, and as recently as last month its secretary general, Jens Stoltenberg, reassured that all 29 member states have "reaffirmed that Georgia will become a member of NATO. "But the war and its aftermath have complicated this ascension process — possibly terminally. "These people feel alone. They feel that nobody is interested in them," said the well-muscled Katsarava, in a camo T-shirt and cargo pants.His organization, Strength in Unity, protests at the boundary and meets family members of people who have been detained for straying across it. He streams live on Facebook and uses other social media channels to whip up interest in his cause. "Of course, we are not thinking that our small group will compel Russia to [leave]," he said. "But if the whole society will unite, I'm sure we can stop the borderization. I'm sure we can force them to step back."